Laminate flooring is an alternative to traditional timber flooring options – it is made up of a synthetic material that is highly durable and realistic in appearance, strikingly similar to actual hardwood floors. We stock a large range of laminates in different colours and sizes to suit your needs. The laminate flooring we sell is incredibly high quality and extremely resilient to scratches and scuffs. 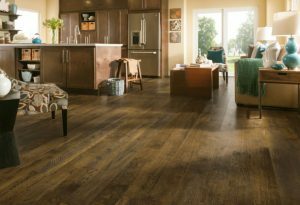 Unlike timber flooring, laminate floors require no sealant or coating, the surface is prefinished making it a preferable choice for the D.I.Y. home renovator – and costs a whole lot less than genuine timber with the same visual appeal. Available in a range of styles, we guarantee to have the perfect laminate flooring to suit the style of any room in your home.